In his comment below, Aaron Larson mentions reading three Jongor books, and sure enough, there are two more besides the one I wrote about a couple of days ago. 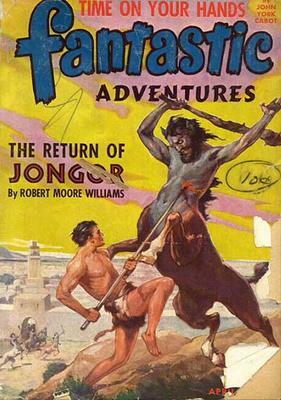 "The Return of Jongor" appeared first in the April 1944 issue of FANTASTIC ADVENTURES, and it was followed more than seven years later by "Jongor Fights Back" in the December 1951 issue of FANTASTIC ADVENTURES. 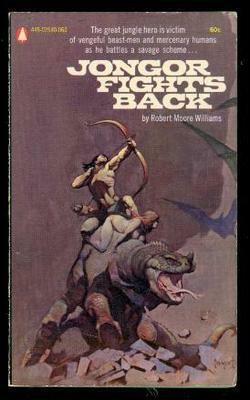 Both stories were reprinted in paperback by Popular Library in 1970, with Frank Frazetta covers. I don't own copies of either of them, but even with my reservations about the first Jongor novel, if I ran across copies of them for a decent price, I'd probably buy them and read them. I recently discovered that Leo Grin, editor and publisher of The Cimmerian, the fine journal devoted to the work of Robert E. Howard, is also writing a blog. The emphasis is on Howard and Howard-related news, but there are also items of interest pertaining to fantasy fiction in general. Well worth checking out. After a couple of weeks of doing a lot of research reading, I decided to take a break and read something just for fun. 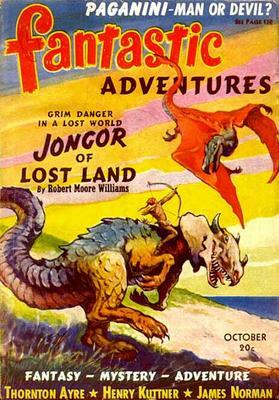 “Jongor of Lost Land” by Robert Moore Williams first appeared in the October 1940 issue of the pulp FANTASTIC ADVENTURES and then was reprinted in paperback in 1970 by Popular Library. That’s the edition I read. I had heard of the Jongor series before but had never read any of the novels. 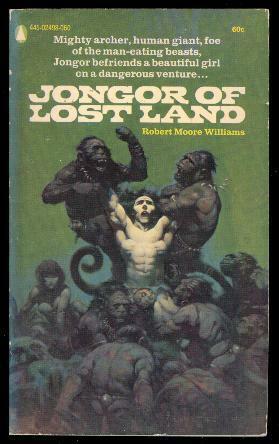 The series is a Tarzan pastiche, and the plot of this first entry is passable imitation Burroughs. Beautiful Ann Hunter has come to Lost Land, an isolated, unexplored wilderness somewhere in the interior of Australia, to search for her missing brother who disappeared there during a previous expedition, the first to actually reach Lost Land. She is accompanied by a companion of her brother’s from the previous expedition as well as a vaguely sinister guide. When their aboriginal bearers turn on them and try to kill them, Ann and the two men are forced to flee deeper into Lost Land, which it turns out is populated by dinosaurs, pterodactyls, and other forms of prehistoric life. 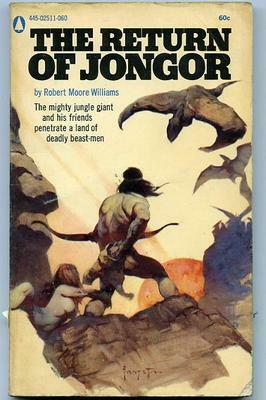 It’s also the home of the mighty warrior Jongor, who spends most of the book rescuing the explorers from various dangers, falling in love with the beautiful Ann, and fighting the evil Murians, survivors from a long-lost colony established by the ancient and long-since-vanished civilization of Mu. As you can tell from even that short description, Williams had certainly read his Edgar Rice Burroughs. Unfortunately, he didn’t possess much of Burroughs’ storytelling talent. The dialogue is stilted even by pulp standards and the narrative is clumsy and repetitive. Another problem is that there’s not even a hint of mystery concerning Jongor’s origin and true identity. All the details are laid out for the reader in bland, boring fashion by Williams. (No, he’s not Ann’s missing brother. That’s established right away.) 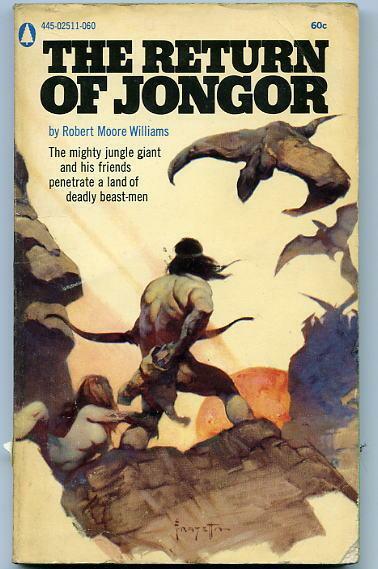 There are a few nice scenes here and there, such as the one where Jongor leads a herd of tame dinosaurs on a charge against the bad guys, but mostly this is a pretty bad book. And yet it rated not only a paperback reprint in the Seventies but also a cover by the legendary Frank Frazetta. Not a particularly good Frazetta cover, in my opinion, but still . . . A lot of old science fiction and fantasy was reprinted in mass-market paperbacks during the Sixties and Seventies, and a lot of pulp fans, myself included, are bothered by the fact that most of the vintage stuff is no longer readily available except in small press editions. But a lot of it probably doesn’t deserve to be, and I’d have to put poor old Jongor in that category. I still enjoyed the break from all the research, though. I've now watched the first episodes of all three of the "alien invasion" TV series that debuted over the past couple of weeks. Even given the similar concepts, there's a surprising amount of sameness to them. Couldn't one batch of aliens have invaded in, say, the southwestern deserts rather than the ocean? "Surface" started first on NBC, and to be honest, I slept through part of the premiere, so I can't really judge it fairly. But what I saw seemed awfully predictable and the script didn't have any lines that really jumped out at me. "Threshold" came next on CBS, but I taped it and didn't watch it until tonight, so I'll postpone comment on it until after I've talked about ABC's "Invasion". "Invasion" was probably the most hyped of the three series, and it was the one I liked the least. I didn't find the domestic drama angles interesting and again, everything seemed really predictable. So is "Threshold", but now that I've seen the first two episodes, I sort of like it. It seems a little more science-fictional than the other two series, the cast is better, and I like the "alien invasion procedural" approach. I'll probably watch it again, and it seems like something I might follow on through the season. We'll see. Around the middle of the week, the weather forecasters were saying that Hurricane Rita was going to make landfall southwest of Galveston (right through Bill Crider's backyard, in fact) and then track up across Texas, maintaining tropical storm force winds and torrential rains all the way to the area where I live. They made it sound so bad I got a little worried, in fact. I remember Hurricane Carla in 1960, which hit Galveston and then was still a pretty powerful storm by the time it reached North Texas. Of course, that's not the way it played out. The wind blew a little harder than usual this afternoon, and I saw some clouds off to the east. That's it. So now I find myself slightly peeved that we didn't even get a little rain out of it (we're in the midst of a fairly bad drought and have already had a couple of trees die, with several others looking pretty bad). I have to admit, though, that I'm glad the worst of the storm came nowhere near here, while at the same time I'm sorry to hear about the damage to Joe Lansdale's place. Now I'm wondering what next week's hurricane is going to be called. Just as my health began to improve, that of my computer got a lot worse. I've had trouble getting on-line all week and have just about decided that this computer will have to be replaced. However, I'm going to have to wait to get paid for a particular book, because I've got that money earmarked for the purpose of upgrading to a better system. Until then, I'll be limping along with the current equipment. I don't know much about hurricanes, and I certainly wouldn't wish any more weather problems on the people in Louisiana, but I'm sure glad Rita decided not to come knocking on Bill Crider's door. Here's hoping it doesn't cause too much flooding or destruction elsewhere. I'm almost three-fourths of the way through the current project, which I suppose is not bad considering that at one point I had to go back and do a considerable amount of rewriting so that my characters' actions would actually make sense, of a sort. But the work has not rolled along as swimmingly as I hoped it would. Lately I've been reading books in a series for which I hope to write. More on that when and if something actually comes of it. The other little tidbit I have to pass along concerns our Nigerian dwarf goat, Festus. (We've had several of these goats over the years, but Festus is the only one left.) There's a large clump of cactus in one corner of his pen, and the other day when I went to feed him, I noticed that he had close to a dozen cactus needles stuck in his muzzle and head. Obviously, he had decided that he wanted to see how cactus tastes, and he wasn't going to let a little thing like getting stuck in the face deter him. Compassionate soul that I am, I told the goat, "I'll come back and pull those out later," and went about some other errands, after which I promptly forgot to return and pull out the cactus needles. But I did remember eventually and let Festus out of his pen so that he could come up on our back porch, where I got one arm around his neck and held on to him while I used the other hand to remove the cactus needles. Unknown to me, while I am doing this, Festus decides this is an appropriate time and place to relieve himself, so he winds up taking a leak all over my shoe. I'm still undecided whether it was revenge for forgetting about his dilemma, or simply happenstance. But either way, the moral of the story is: The next time you're pulling cactus needles out of a goat's face, watch your shoes. Western pulp covers usually weren't very humorous, but here's one that's at least a little whimsical, provided by Jim Griffin. The luckless cowboy's bath has been interrupted by bushwhackers. I think the art is by H.W. Scott, although I could be wrong about that. 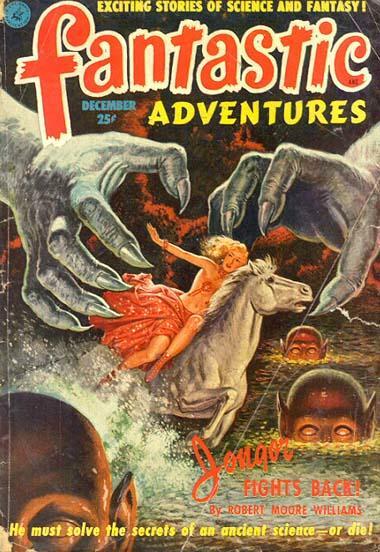 The lead novel in this issue is by the prolific Harry Sinclair Drago, who also wrote as Bliss Lomax (one of the great Western pen-names) and Will Ermine. Later in his career he wrote several volumes of very readable Western non-fiction, such as THE LEGEND-MAKERS. This cover also appears on the WesternPulps website this week. For any of you wondering about my absence the past few days, it's been due to some minor health-related problems and an abundance of work. Nothing to worry about, though, and I plan to get back to updating the blog on a more regular basis. I've talked about tie-in novels and movie novelizations on this blog before, and there's now an organization for writers of these sorts of books. The International Association of Media Tie-In Writers was formed recently by Lee Goldberg and Max Allan Collins and now has an official website up and running for both members and prospective members. I'm a member of IAMTW (my WALKER, TEXAS RANGER tie-in novels qualify me for membership) and I think it's going to be an excellent organization. Check out the website if you've written tie-in books, would like to write tie-in books, or just like to read in that genre. There are already quite a few interesting articles posted about the business, the craft, and the art of writing tie-in novels and movie novelizations. As for me, I'd love to do more tie-in books. I really enjoyed writing the Walker novels. The Official Hopalong Cassidy Website covers the various version of Hopalong Cassidy in books, films, radio, and TV. This is a nice-looking website that concentrates on the movies, but there's worthwhile information about Clarence E. Mulford's novels to be found there, too. Then there's the Official Roy Rogers and Dale Evans Website. Roy and Dale are long-time favorites of mine, too. Thanks to Christine Jeffords of the WesternPulps list for the links. We watched the "Director's Cut" DVD of Oliver Stone's ALEXANDER today. If this version really is "faster paced" and "more action-packed", as the box claims, then I'm glad I didn't see the theatrical version. There are a couple of okay battles, one early and one late (the later battle is especially marred by that blasted quick-cut editing that I really don't like), and some nice scenery (including Angelina Jolie), but other than that it's pretty much a snoozer. 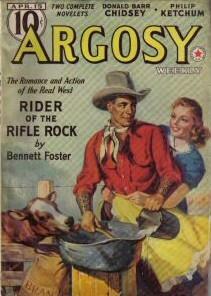 Popular bought NEW WESTERN, BIG BOOK WESTERN, and NEW DETECTIVE from Two-Books Magazines in early 1936. 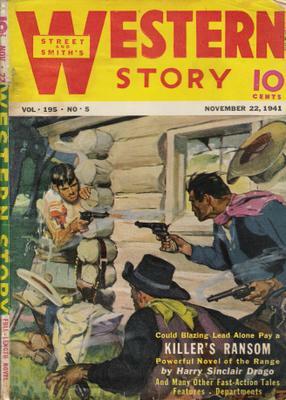 Steeger [Henry Steeger, publisher of Popular Publications] kept BIG BOOK WESTERN on the stands but the other two languished until 1940, when they came out under the Fictioneers imprint. 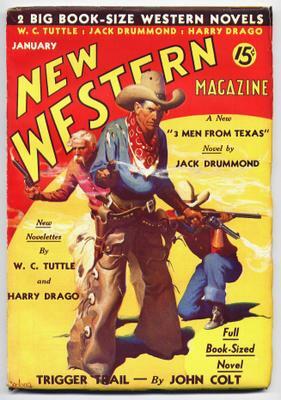 This issue of NEW WESTERN was the last published by Two-Books. The magazine was originally called TWO-BOOKS WESTERN; I think the title change was made somewhere around 1935. For some reason, Two-Books issues of BIG BOOK WESTERN seem to be more common than NEW WESTERN. I have no idea why that would be, because both titles relied on the same contributors. I can't imagine that one sold appreciably less than the other. I try not to say too many negative things about other authors’ work. For one thing, I know what a tough business this is, even for those who are successful, and for another, if you’re talking about an author who is a lot more successful than you are, anything bad you say will be construed as sour grapes by some people. However, in the past I’ve been known to make the occasional snarky comment about James Patterson’s books. I feel bad about it, but I do it anyway. I have to admit, though, that Patterson’s success interests me. There’s something in his work that appeals to vast numbers of people, and I’d like to know what it is. Accordingly, I’ve started reading at least half a dozen of his books over the years, only to not finish them because I just didn’t like them. But to my surprise, the one book of his I did finish, the historical nover THE JESTER (co-written with Andrew Gross), I really liked and thought it was one of the best books I read that year. Now I’ve finished another Patterson novel, HONEYMOON, published earlier this year and co-written with Howard Roughan. It’s a serial killer novel, a sub-genre that Patterson seems to like, and it’s pretty good. There are some flaws – the writing is pretty flat and purely functional, and the characterization is awfully shallow – but the plot has some nice twists and the pace is very fast and generates enough suspense that I was really flipping the pages in some scenes to find out what was going to happen. That’s good storytelling. Bill Parcells is fond of saying about football teams, “You are what you are.” Patterson’s books are what they are, I guess. He does things I don’t like – the extremely short chapters and the mixture of first and third person – but if I just accept that that’s the way they’re going to be and try to judge them on their own merits, maybe they’re better than I thought they were. I’m sure I’ll continue trying to read one every now and then, just to see. Since I realized yesterday that I was an idiot, my task today was to go back and see if I could undo all the damage I'd done to the current manuscript. The plot fix came first. I went through the manuscript looking for all the places where I'd try to force it to go in a direction it didn't need to go. In most instances the problems weren't too bad. Delete a few paragraphs here, rewrite a few paragraphs there. But in one scene when I took out the stuff that had to come out, I was left with a big gap. I couldn't figure out what to do there, so I put it aside and went to the protagonist problem. Again, not too bad. Mostly I added lines of dialogue and bits of interaction with other characters to make the protagonist's personality a little stronger and to set up some things that will come later in the book. And the work I was doing on him circled back around to the plot problem and made me realize what I needed to do there. So after spending most of the day deleting, revising, writing new material to replace what I'd deleted, and cutting and pasting a bunch of text here and there, I realized that I was smack-dab on the original line of scrimmage. I had the exact same number of pages that I did before I started the repair job. To a page-obsessed ol' pelican like me, that was unacceptable. Now, though, instead of the dead end I was facing yesterday, I could see what needed to happen next, so I was able to forge ahead and add five pages to the total. Doesn't look that good on the stat sheet, to continue the football allusions, but I felt like it was a good day's work, anyway. Early on in the book I'm writing, I began to get the sense that something wasn't right with it. I kept plugging away at it, since a lot of times such misgivings turn out to be false. This time, though, I kept worrying more and more about it, and finally after a bad day today, I had to just stop writing and try to figure out what was wrong. Turns out it wasn't one thing, but two. There's a hole in the plot that has to be fixed. This will require not only some rewriting but also some throwing out of work already done, which I hate. The plot's got to make sense, though, so I don't have much choice. The other problem is in the way I've been writing the protagonist. He's just fundamentally wrong for this book, at least the way he's acting now. I need to go back and revise his scenes, which I hope won't be too much of a problem. I don't normally stray this far from what I need to be doing. None of it should be too hard to fix, though, and once that's done maybe the book's pace will pick up. My disappointment with the movie version of SIN CITY prompted me to read something noirish and hardboiled, so I went to my shelves and grabbed a copy of CASSIDY’S GIRL by David Goodis. Goodis is one of those odd gaps in my hardboiled reading. I own quite a few of his books and have been aware for a long time of his reputation as an excellent writer, but until now I’d read only one of his novels, NIGHT SQUAD (which I liked). CASSIDY’S GIRL is one of his best-known novels, and it really is a good one. Goodis was better than most at depicting the lives of boozers and losers. There’s a crime of sorts in this one, but it’s less of a mystery than it is a whiskey-soaked romantic triangle. That doesn’t mean there’s not plenty of suspense in it, though. My only complaint is that every now and then Goodis falls into the trap of telling more than he’s showing, but that’s minor and most of the time the book races right along and builds to a heck of an unexpected and satisfying ending. CASSIDY’S GIRL is a very good book, and I’ve got to read more of Goodis’s work. Bibliographic note: Although CASSIDY’S GIRL was first published as a Gold Medal original in 1951, I actually read the 1967 Dell reprint edition, with cover (and not a particularly compelling one) by Barye Phillips. I own a copy of the Gold Medal edition but it’s not in very good shape, so I figured the Dell would make a good reading copy. A while back I decided that when I finished reading all the library books I had checked out, I wasn't going to get any more because I needed to read more books that I own. Especially from the Leaning Tower of Paperbacks, which is still leaning precariously. I thought I was being pretty strong and sticking to that decision, but then suddenly, and without quite knowing how it happened, I realized that I have nine books checked out from three different libraries. I'm hopeless, hopeless, I tell you. I suppose I probably saw every episode of GILLIGAN'S ISLAND at least once. Some of them I saw more than once. It was almost inescapable for a while there. But to me Bob Denver will always be Maynard G. Krebs. No disrespect intended to the rest of the cast of THE MANY LOVES OF DOBIE GILLIS (including the great Frank Faylen), but Bob Denver stole that show week after week and was the real star as far as I was concerned. I'm sorry that he's gone and hope that he rests in peace. Some things that work really, really well in comic books don't work nearly as well on film. This movie is proof of that. SPLINTERED ICON, the debut novel from Scottish astronomer Bill Napier, is one of those books that’s hard to categorize. It’s part contemporary thriller, part historical novel – and all thoroughly entertaining. Originally published in England in 2003 under the title SHATTERED ICON, it’s just been published in the U.S. by St. Martin’s Paperbacks. Antiquarian bookseller Harry Blake is hired to translate and appraise the manuscript of a journal that’s hundreds of years old. Harry gets caught up in the story contained in the journal, which was written by James Ogilvie, a cabin boy on Sir Walter Raleigh’s expedition to the New World in 1785. Not surprisingly, some sinister characters express an interest in the journal and try to pay off Harry to double-cross his client, the British aristocrat who owns the journal, and give them the faded old pages. Harry refuses, of course, and that opens the door for all sorts of trouble and danger for him and some of his friends. Obviously, there’s something in the journal that’s very important to some present-day bad guys. Napier cuts back and forth between Harry’s attempts to elude the villains and discover the secret of the journal, and the story of James Ogilvie’s adventures as a member of the expedition that has some secrets and murders of its own. The story stretches from England to the New World in the Sixteenth Century and from England to Jamaica in the present, and it generates a considerable amount of suspense along the way. I always enjoy a book that slowly peels back the layers of its plot, and Napier does a good job with that in SPLINTERED ICON. I enjoyed this novel enough so that I’ll definitely keep an eye out for Napier’s next book. One of the blog readers is trying to locate Edward Goldstein, who was the last publisher of MIKE SHAYNE MYSTERY MAGAZINE before it folded, and also the heirs of author Raymond E. Banks, who wrote for MSMM and died in 1996. If anyone has information that might help, please email me (there's a link on my Blogger profile page) and I'll pass it along. Many thanks. 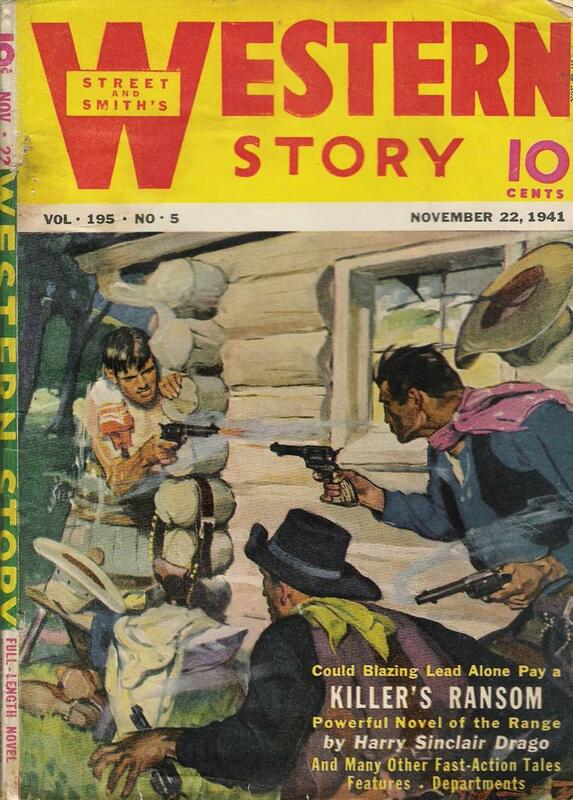 This week's WesternPulps scan depicts an unusually domestic scene for a Western-themed cover. Maybe that's a bad guy disguised as a cow. HOSTAGE -- Any movie with Bruce Willis where a bunch of stuff blows up real good will have at least some entertaiment value going for it. That's my theory, anyway, and it holds true here. I read and enjoyed the book by Robert Crais, and while the movie makes quite a few changes in the story, the source material is at least still recognizable. THE AVIATOR -- Mixed reaction to this one. It's beautifully filmed and a lot of the actors in the supporting parts are good. In order for it to be a tragedy, though, don't you have to have some sort of sympathetic feelings for the hero (in this case Howard Hughes) for his downfall to be effective? DiCaprio never made me like Hughes enough to feel much when things went bad for him. I liked Kate Beckinsale as Ava Gardner, though. (I have a feeling I'd like Kate Beckinsale in just about anything.) Cate Blanchett's much-praised portrayal of Katherine Hepburn just didn't work for me. She doesn't look enough like Hepburn. THE FLIGHT OF THE PHOENIX -- I read the Elleston Trevor novel years ago and also saw the original version of the movie, which starred Jimmy Stewart. Pretty good cast in the remake and some nice moments, although the whole thing was a little slow. The novel is the best of the three versions, though. BOTTLE ROCKET -- A ten-year-old indie film about some bumbling would-be criminals in Texas, an early effort from Luke and Owen Wilson (who also co-wrote the script). When the word "quirky" is the first one that comes to mind when you're trying to describe a movie, that's not a good sign for me. Good acting and some decent, fairly amusing moments, but not enough overall for me to say that I liked it. as soon as Dirk and Al uncovered the ironclad, I knew they were going to get one of the cannons to work and shoot down the bad guy's helicopter with it because that's exactly the way I would have written it. No wonder I thought this movie was so good. I have several other movies checked out from Blockbuster, so expect more comments in the days to come.